The Zombie Invasion continues over at Copic Marker Scrapbooking. Here is another creepy-cutie to share with you. And this is exactly why I don't like going to the doctor. I guess as long as they don't tell me to get my head (brains) examined, I might be okay?! 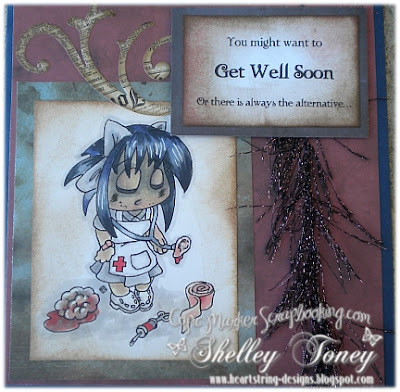 Hey did you know that Copic Marker Scrapbooking is adding some "blood" to their Design Team? If you like Copics, and like to color with Copics, go check it out and try for a spot on the team. Then we can be teamies!! :) Today is the last day to apply! HURRY! She is too cute!!!! LOVE your nurse zombie!!! Fab card! That image is great, and I love the aged look of the card :) The sentiment is perfect too!